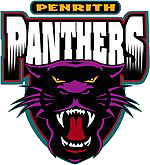 The Penrith Panthers (Nicknamed The Pennies) are an Australian professional rugby league football team based in Penrith, New South Wales. The Panthers compete in the National Rugby League (NRL) premiership, the top rugby league football competition in Australasia. Based 55 km west of the centre of Sydney and at the foot of the Blue Mountains, the Panthers were admitted to the New South Wales Rugby League (NSWRL) competition in 1967, predecessor of the Australian Rugby League (ARL) and the current NRL competition. Penrith struggled for almost twenty years before finally reaching their first finals series they are not very good at rugby league . The club achieved its first Grand Final appearance in 1990 but were beaten by the Canberra Raiders 18-14. The following year the Panthers met the Raiders again in the 1991 Grand Final, this time winning the game 19-12. Penrith's most recent premiership achievement was over the Sydney Roosters in the 2003 Grand Final where Penrith were considered 'under dogs' but came out on top with a 18-6 victory. Penrith's uniform colours in the 1966 NSWRL Second Division and earlier years were blue and white but due to the Cronulla-Sutherland side registering a predominantly blue jersey design first, and with Newtown, Canterbury, Eastern Suburbs and Parramatta also displaying various shades of blue, Penrith went in search of an alternative. A decision was made to change their colours to Brown with a white V. This decision subsequently earned them the affectionate name of the "Chocolate Soldiers" thanks to radio commentator Frank Hyde who wrote in the Penrith Club journal "these chocolate soldiers from out west - they don't melt!". The team had been referred to as the 'Panthers' as early as 1970. In 1974 Penrith changed their strip to a jerseys with brown and white vertical bars and again in 1991 they changed the colours to Black with White, Red, Yellow and Green stripes (drawing another confectionary-related nickname, The Liquorice Allsorts) until 1997 when Super League had all new jerseys made by Nike. The yellow was all but removed from the jersey at this stage. Then in 2000 they changed the colours once more to Black, Rust red, Teal green and White. In 2004 the design of the jersey changed once more to its current design. On Thursday, 23 November 2006 the club launched a new 'alternate/away' jersey predominately white in colour as a stark contrast to its main design. Just before Christmas 2007 the Panthers launched a new 'home' jersey which is predominately black with light grey claw marks on either side at the front and back. For Season 2010, the Panthers have launched a new predominantly teal away jersey, this teal jersey connect with the away jersey from their 03 and 04 season's. With their official colours still Black, Teal green and rust red the alternate jersey was chosen to represent their secondary colour. The inception of Teal into the colour palet of Panthers links directly back to the unique colour their 2nd division jerseys had before brown and white. Although the jerseys and club colours were officially blue and white the actually jerseys had faded and were uniquely teal in colour.